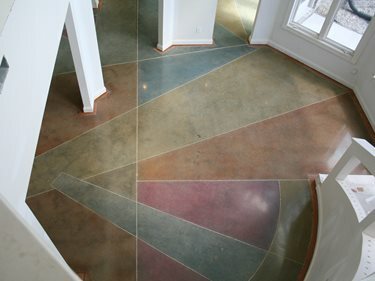 Can All Concrete be Polished? 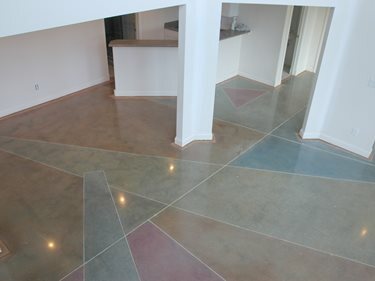 "When I first saw this floor I thought I had just wasted my time on this sales call because there was no way I wanted this job," said Kerry Calvert of Artistic Surfaces. "It was very ugly." 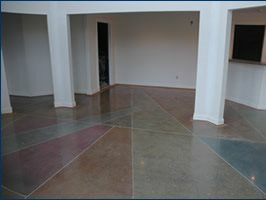 As a remodeling job, when Artistic Surfaces arrived the floor had been under carpeting for several years. "What we found was the typical post-construction mess of drywall and so forth that had been there since the house was built since it was covered with carpet, they didn't care. The carpet had been tacked down instead of glued down so that created a lot of problems along the edges because of all the chip outs from where the nails were," said Calvert. He explained to the owner what could be done to fix the chips, cracks, and saw-cut joints or to work them into the pattern and "he was still fired up to do it so we took it on." Calvert has generally found that with residential slabs he gets mixed results, generally on the low side due to the quality of the finish. "What we usually find, as we start polishing, is that they use a lot of fly ash and cheap concrete so you start getting a lot of lift off the surface--the surface gets little pebble holes and pock marks that are a visual distraction and don't take stain well. On this floor, there were a couple of hairline cracks but the contractor had put in control joints and we leveraged our design off those control joints." "There were only a couple of areas on the slab that were not troweled flat enough, which increases the difficulty of polishing, but the grade of concrete used on the pour was higher than a typical residential slab. Those two factors are real differentiators on whether the quality of polish will match commercial projects where the finishing and concrete specs are normally higher than on residential concrete," Calvert said. When originally poured, the contractor had used a curing compound that left black spots on the surface. Calvert started by grinding the floor deeply enough to get to a clean surface, grinding off the top 1/8 inch or so. "There were 4 rooms, the whole bottom floor of the home," Calvert said, "and each room had a design element and multiple colors. So after we had prepped the surface to where we were ready to go to the resin cycle of the polishing, we cut in the decorative lines then we applied the dye." Calvert's practice is to dye the floor before taking the polishing too high. "We always put the dyes down before we've gone too far into the resins--before the 400 resin polish--because the higher you go into the resins the more you're closing up the surface and we want to get the dye to penetrate as deeply as possible." Artistic Surfaces workers then polish the floor to a 3000-grit finish, working in a sodium silicate surface hardener, and follow that with a second application of dye. "My thinking is that if you put the dye down before the hardener then the hardener sort of locks it in," said Calvert, "and the additional dye then enriches the color." On this project, Calvert used Colormaker Decographic dyes and Brickform Dye-N-Seal to get the exact colors the owner wanted. To repair nail hole chips around the edges where the carpet tack strip had been, workers taped off a line then troweled-on a polymer concrete and colored it with an acrylic stain, which Calvert has found works well on polymer-based concrete. 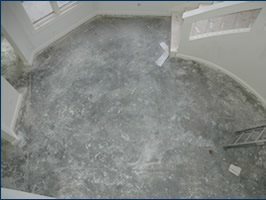 "We've had a lot of trouble trying to stain polymer concrete with either acid-based stains or dyes. The acrylic stains from Smith Paints give us consistent and durable color. 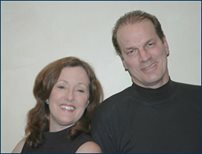 Artistic Surfaces was founded 10 years ago by Beth and Kerry Calvert. Beth studied fine arts at Hanover College and Indiana University, and has design and creative expertise in a variety of mediums. Kerry is a graduate of the Engineering schools at the University of Texas and the University of Wisconsin. 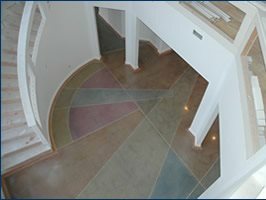 After spending 25 years solving engineering and manufacturing problems in high tech industries, he merged his technical, business, and project management experience with Beth's artistic creativity to expand into decorative concrete.